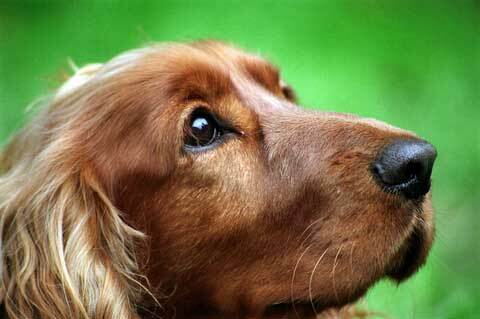 Eye problems in dogs can cause your pet considerable pain and misery. 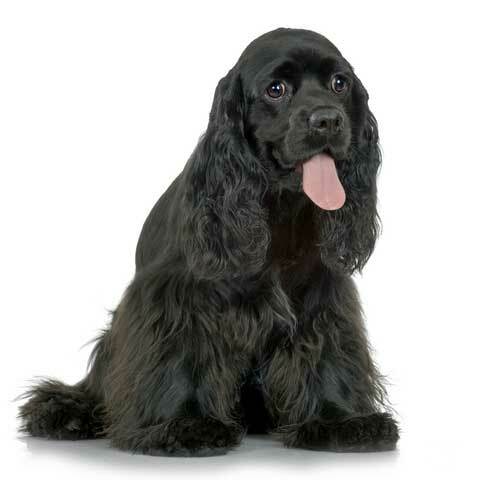 Understanding what symptoms to look for and regular checks will help you to keep your Cocker Spaniel's eyes clean and healthy. Read on to learn more. There are a few things you can do to help keep your Cocker Spaniel's eyes (and sight) safe and sound and checking them often is one of them. Now this might seem pretty obvious, but it's often overlooked. It doesn't need to take long, just have a good look at his eyes every day to make sure all is well. If you're not sure what you're looking for, I've listed the symptoms of dog eye problems further down the page. Keeping your pet's eyes clean will help to avoid bacteria or infection. When you check your pet's eyes, as part of his grooming routine, be sure to remove any sleep or anything caught in his lashes and take the time to clean the fur around his eyes. While you're at it, give the entire eye area a quick inspection for potential problems. I usually clean Max's eyes after a walk because he's less likely to wriggle when he's tired! Have your dog sit on the floor in front of you. Use a clean cotton bud to remove any 'gunk' in the corner of his eyes. Take a cotton-wool ball soaked in a solution of 1 cup of distilled water and half a teaspoon of salt and gently clean the fur around his eyes, (especially if he's got a problem with excess tearing). Be gentle and take care not to touch his eyes with your fingers or the cotton-wool ball. Use a separate cotton ball for each eye to avoid possible cross infection. Do this at least once a week and you'll be well on your way to helping your Cocker's eyes stay clean and healthy! There are many other things you can do to help keep your pet's eyes healthy, and they're pretty much common sense, but I'll mention them anyway. Try not to get soap or shampoo in your dog's eyes when bathing him as it will cause irritation. Don't use any drops in his eyes unless your vet has specifically prescribed them for him. Don't allow your Cocker Spaniel to ride in the car with his head out of the window - yes, we've all done it - but it can be dangerous! Dust, grit, or insects can easily be 'blasted' into his eye(s) by the wind and cause damage. The wind can also have a drying effect, causing in irritation, infection, and other dog eye problems. If your pet has something embedded in his eye, a thorn for example, never try to remove it yourself; let your vet do it. Eye problems in dogs can range from very mild irritations to severe conditions that need immediate professional medical treatment. If you're in any doubt about the condition of your pet's eyes, please consult your vet immediately. he may develop 'gunk' around his eyes. increased irritability and pain. If his eyes are irritating him, or they're painful, he may paw at them or at his face. in serious cases of eye problems in dogs, their vision may begin to deteriorate. If your Cocker Spaniel suddenly starts to bump into things or he can't find treats that you've thrown onto the floor for him - these could be signs of diminishing eyesight. Like our own, our dog's eyesight is very precious. It's essential to be observant and recognise the signs of eye problems in our dogs at an early stage, before they have a chance to become a real problem. I can't emphasise this enough, if you notice any of the above signs in your pet, take him to see his vet without delay. The sooner your vet takes a look at your dog, the better. Please don't wait a couple of days to 'see if it clears up' and don't try to diagnose the symptoms yourself, leave that to the professionals.